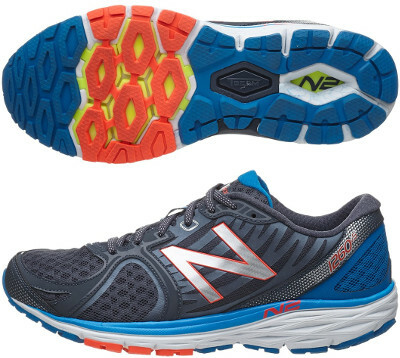 New Balance 1260 v5 are stability cushioned running shoes. The New Balance 1260 v5 is the fifth edition of the premium running shoe for overpronators from the american brand. The 1260 v5 features a comfortable ride based on plush cushioning and reliable stability with an updated modern design and energetic colours to make them more attractive within stability cushioned running shoes category. Major change from its predecessor the 1260 v4 focuses on improved flexibility for smoother transition: midsole's wall get inspired by Fresh Foam geometry for better compression and N2 (Nitrogen fused) burst combined with decoupled outsole for responsive cushioning as seen on other New Balance models like 1080 v5 and 880 v4. Heel counter for lower lateral support and the redesigned T-BEAM shank deliver torsional stability through the midfoot. Motion control relies on three separate foam densities (durable ABZORB® cushioning closest to the ground, plush ACTEVA® LITE against the foot and post-applied medial support) building the 1260 v5's midsole guiding feet forward. Breathable mesh upper has been upgraded with new design of welded overlays (FantomFit) to provide a better fit and also more modern and energetic design.